The power and destruction wreaked by hurricanes, cyclones and typhoons the world over is well known, but did you know that the floods caused by these massive weather systems are the number one cause of death by natural disaster in the world? Their scale even outstrips earthquakes and volcanoes due in part, to their ability to affect a huge area. Hurricanes, cyclones and typhoons are all different names for the same thing: tropical storms which form over the world’s oceans. These storms are called hurricanes when they form over the eastern Pacific Ocean or Atlantic Ocean. 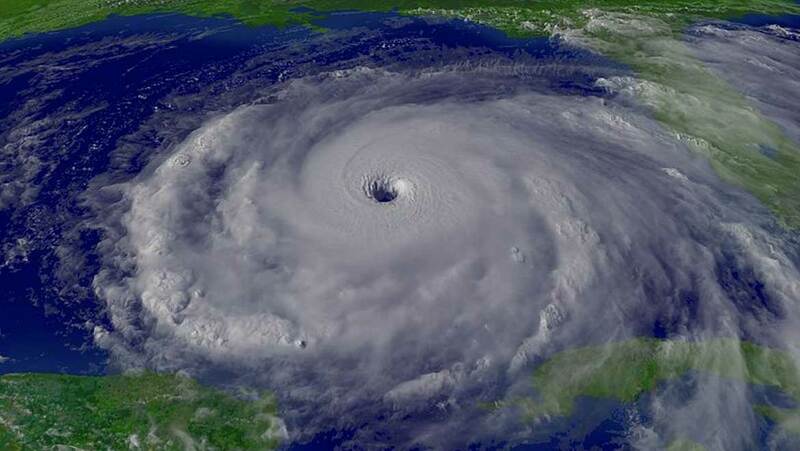 In a day, the average hurricane releases the same amount of energy as half a million small atomic bombs. This includes high winds of up to 160 miles per hour, oceanic storm surges which can reach heights of up to 20 feet in height and travel up to 100 miles inland; and torrential rains which can release more than 2.4 trillion gallons of rain per day. So, the ability to accurately predict the path of these storms is vitally important, especially when you consider the best line of defense against hurricanes is evacuation of any potentially affected areas. This of course, depends heavily on meteorologists being able to accurately predict the path that they think the hurricane is most likely to take, and then warn those affected. Hurricane warnings are usually issued for storms that look like they will make landfall in the next 24 hours and give residents in affected areas the chance to prepare for potential consequences and evacuate the area. In the US, one of the largest storm surges occurred when Hurricane Katrina hit Mississippi in 2005, and the resulting surge was up to 8 meters high. In 2012, New York City also felt the impact of Hurricane Sandy, with a surge of up to 4.2 meters. Additionally, the rains caused by a hurricane can also cause inland floods and landslides, thus adding to the destruction over a potentially huge area. Scientists at a wide range of different organizations are working hard to improve their knowledge of hurricanes, with computer models being used to simulate the weather and climatic conditions which generate these deadly storms. Hurricanes, and all tropical storms, are incredibly complex phenomena and the modeling of them requires both powerful computing systems and access to a wide range of weather data across a huge area. Unsurprisingly, models created by different organizations often predict different paths for these storms, and gaining a better understanding of why this is can be used to improve the computer simulations themselves. One of the very best examples of this is Hurricane Sandy. Whilst modelling the potential path of this devastating hurricane in 2012, the American Global Forecasting System (GFS) model suggested that Sandy would dissipate over the ocean, causing minimal impact on land. The European Center for Medium-Range Weather Forecast (ECMWF) model however, predicted that the hurricane would move westwards, eventually hitting the East Coast of the US. As we all know, the prediction of the ECMWF was far more accurate. Hurricane Sandy did indeed end up hitting the US as well as seven other countries including Cuba, Jamaica and the Bahamas. Hurricane Sandy caused 233 deaths and $75billion worth of damage across the path of the storm. There are a number of reasons that the European model and the US model often predict different outcomes. The European model draws on more weather data, from a wide range of sources including weather balloons, satellites and ship-based weather stations. The computer system used is extremely powerful and can analyze large amounts of data. Additionally, taxes from member nations are used to keep funding levels up, as well as charging other forecasters to access this data for their own use. In contrast, the instability of funding in the US creates problems in establishing and maintaining systems. That said, the National Oceanic and Atmospheric Administration (NOAA) has over the last few years put a significant amount of funds into increasing their computer power, which should result in a better resolution of forecast. In a basic form, you can imagine the computer model to be made up of pixels, like a photograph. The higher the number of pixels, and resulting resolution, the better the forecast itself. The Global Modeling and Assimilation Office (GMAO) which is part of NASA, is also tasked with producing models of hurricanes in the attempt to better understand their potential path. The GMAO has been working hard to increase the resolution of their models, thus increasing the accuracy of their forecasts. In 2005, the size of each ‘pixel’ was approximately 31 miles. This has now decreased to 8 miles, drastically improving the resolution and allowing for potentially a better forecast altogether. The efficacy of these models can be checked by using models of past hurricanes. The closer the results are to the actual path that the hurricane took, the better chance of the model being able to accurately predict future hurricanes. One of the latest models produced by the US GMAO is able to predict factors surrounding the weather system that produced Hurricane Katrina to produce outcomes that are very similar to those that were observed in real life. Whilst we will never be able to remove the dangers of hurricanes altogether, working on improving the accuracy of these computer models means that hopefully in the future, predicting the path of these storms will be increasingly accurate, thus giving those who live in affected areas the chance to fully prepare themselves for the incoming storm.